2. Raw is the ultimate diet – Raw is the ultimate diet if you are only consuming fruits, leafy greens and starchless veggies (which comes later on, after a proper transition diet). Where the trouble lies is when raw foodists eat grains, starchy veggies, corn, legumes all raw. These foods are even more mucus forming in their raw state & would be better off “elimination wise” to cook or toast them well to eliminate some of the mucus forming properties. 3. An all fruit diet will heal you right up – Fruits are the ultimate healing food after you detoxify your body somewhat through a “mucusless diet” to be able to receive the benefits fruits offer. (fruits aid in this needed detoxification)…if your dealing with kidneys that don’t filter, malabsorption or sickness, there are important transition steps to take to prepare your body & mind safely for consuming & receiving the benefits from fruits. Fruits are the most powerful, detoxifying food on this planet & most individuals are so encumbered with mucus, acids & toxemias (from lifetime of wrong foods, vaccines & pharmaceuticals) that an immediate all fruit diet is too harsh & will bring forth their inner encumbrances too quickly (Ashton Kutcher) this can become painful & dangerous… the body needs to be prepared for at least a few months with a proper transition diet before jumping into fruits. There are individuals who jumped into all fruits immediately & succeed in detoxification & health, it can be done but many are not ready physically or mentally to do so. 3. Dairy builds strong bones – Dairy does the opposite. Dairy is mucus forming and acid forming. When you ingest acid forming substances (high proteins) your body goes into damage control mode – your blood must always maintain its ph around 7.2 or you would die. In order to maintain that blood ph, your body will DRAW CALCIUM from your connective tissues. This creates long term issues. The mucus that dairy creates within contributes to excess weight, gets stored throughout your tissues and organs – interrupting organ functions & adding to accumulated waste. Even allopathic doctors will recommend not ingesting dairy when sick. 4. 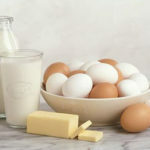 Eggs are healthy – Eggs are the highest albuminous (protein rich) food that you can consume Eggs are liquid flesh and eggs are not only highly acid forming they are constipating. Eggs are terrible for our bodies. 5. Proteins are healthy – Proteins break down the fastest within the body and create acids (main cause of disease) protein is a fancy word for amino acids.. We can easily derive amino acids from plants food or fruits in the quantities designed for our species. High protein foods are one of the largest contributing factors to the diseases & sickness we see today. This information seems to be purposefully hidden from the general public – or medical science & allopathic doctors are just that ignorant. Most people have serious issues due to a backed up lymphatic system, the kidneys stop filtering due to these high proteins & cellular waste cannot escape – therefore it manifests in the form of skin issues, graying hair, cancer, lymphoma (all names for the same root cause – systemic acidosis to different DEGREES). 6. Breakfast is the most important meal of the day – Actually an early breakfast does more harm than good. Your breaking that fast from the night before. That only rest (besides sleeping) that your body gets from digesting food. This is why sleep is so important. An early breakfast leads to more meals throughout the day. The word Break-Fast sais it all. Give that digestive a rest and you will find once your body is cleaner that your most energetic point of the day is before you eat. 7. Three meals a day is ideal for health – Three meals a day is flat out too much for your body to digest. Three meals is great for the food industry & profits. Two meals a day is more than enough, our stomachs do not want to be continually stuffed… less is more! 8. Fasting is dangerous – Fasting is our built in medicine, the ultimate healer for our bodies even more so than ingesting healing foods. Fasting gives our digestive system a break so the body can heal issues. Fasting is only dangerous when an individuals internal encumbrances are not recognized and dealt with accordingly or a highly toxic individual takes too long of a fast too soon. Proper knowledge and preparation is key. Intermittent fasting can safely be done by any individual and is easily adhered to. Just skipping breakfast can have tremendous healing and detoxification results without doing much. Intermittent fasting will train your body to engage in a longer fast if desired down the road. How you break a fast is of great importance. It’s always best to start an empty stomach on fruits. Fruits are the most cleansing, easiest to digest & will reprogram your body to rebuild the blood on correct foods. 9. You catch a cold or sickness – All experienced disease or sickness stems from within. There are environmental triggers which cause the body to release your internal mucus & toxins. Disease and sickness stem from within – medical science would like you to believe it’s not in your control. The most sever issues (cancer, etc) have been building up within your body for 20, 30 years. There is no outside source to blame , only your individual habits… you could blame your health issues on your “genes” but if you took care of your body to begin with you can easily reverse any inherited weakness or predispositions from your parents health issues when they created you. We are the sole cause for any pain we experience (vaccines and pharmaceuticals are accumulative & add to internal issues) – there is always remedy if conducted properly & caught within a timely manner. Our bodies are amazing machines and can heal almost anything from poor eyesight to cancer!